OH HAPPY FALL, HOW DO I THANK YOU? We have finally come to my favorite time of the year – FALL! Woo Hoo! It is the time of year to harvest, to see my beloved colors! There was book that came out decades ago about “your color”. You matched which colors work best with your skin tone and that would give your select of colors that would look best on you. Well, I could have pegged that without even looking! It’s fall for me! Winter is wonderful, Christmas is magnificent, but fall is brilliant! 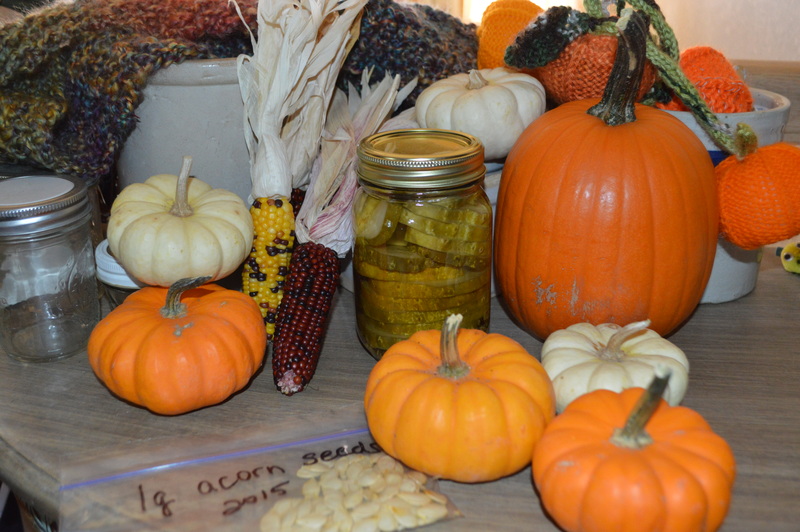 The colors, the farm fresh foods, the canning and food processing – yum! Up to this point we have been taste testing a few goodies, just here-and-there, but now we have the “abundance” phase! Canning jars, vacuum sealers, pressure canners, freezer bags, dehydrators, old fashioned drying, oven drying, oven canning – take your pick, or be like us and pick them all! We have found over the years that some things just taste better done up a certain way. The other fun thing to do this time of year is start saving seeds. This, for us, goes hand-in-hand with food processing. Pickles just are not pickles without fresh dill. We have also found that dill is not just for pickles – excellent in pasta and potato salads, breads, dinner rolls and I even put a bit into my homemade chicken dumpling soup (sorry dad – I didn’t keep with the German family recipe.). It is just one of those great flavors that can go in so many different thing. Saving their seed is one of the simplest things to do. When the dill stalks start to grow and begin to flower, I will start clipping “ferns” off the branches – NOT ALL OF THEM! You need to keep some on to help the plant. The ferns get clipped into a small brown back and left open to air dry. You can also spread them out on a sheet, but the bag is faster easier to me. Then once the flower sets into seeds, I cut off the top again into a small brown bag. (Don’t clip off ALL the heads and don’t worry if some fall to the ground – it’s a good thing.) Then I sit down with my bag in front of a great movie and gently run my hand over the seed heads. This knocks the seeds to the bottom of the bag. I occasionally pull up the head to see if I have all the seeds off – if yes throw the stem into the compost pile – if no then repeat. A large portion of the dill seeds get scattered to the winds in the beds all over the farm – on purpose – by us! Just about everything grows well with it. The Monarch and Swallow Tail butterflies love it (we also keep milk weed pods on the farm for them). It is a normal deterrent to a number of bad bugs, and I love the smell! I hope by now you are hungry for both the gorgeous autumn colors and a huge bowl of dill potato salad! Enjoy. ← Where have I been for the last 3 years?